Originally founded in 1899 as a part of Britain’s Royal Mint, the Perth Mint of Australia now works under the control of the Government of Western Australia. While it is the Royal Australian Mint that now produces coins for circulation, the historical Perth Mint still strikes collectable precious metals coins, including the Australia Lunar Series. Even though these coins are collectables due to their precious metal content and limited production, they are also legal tender in Australia. In this regard, the Lunar Series is similar to American collectable coins like the contemporary Eagle Series. Australian Lunar coins were struck between 1996 and 2007. 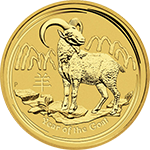 Each year, the one-ounce gold coins featured a different design for that particular year in the 12-year Chinese calendar. This ancient calendar dates back thousands of years to before 2,600 B.C. and is rich in tradition and meaning. Each year in the calendar is represented by a specific animal, namely the pig, dog, rooster, monkey, goat, horse, snake, dragon, rabbit, tiger, ox, and mouse (listed here from last to first struck). Hence, the reverse side of a Lunar coin displays the animal symbol for the specific year in the Chinese calendar. The obverse features the profile of Queen Elizabeth, as required by law. Interestingly enough, the portrait of Queen Elizabeth matures throughout the series. In 1996, the year the series was introduced, the profile was of a younger Elizabeth. However, in 1999, the profile changed to an image of a more mature woman as had Buckingham Palace altered the official likeness. This series grew in both popularity and production over time. For example, the Perth Mint produced its first Year of the Mouse coin in 1996, when only gold coins were issued. By 1999, the Year of the Rabbit coin was also struck in silver. Moreover, Lunar coins were only available with the net fine weight of 1 ounce. However, in 2000, the Perth Mint struck Year of the Dragon gold coins with a net fine weight of up to 1 kilo. In 2004, Perth added a 1/2 ounce gold coin with the Year of the Monkey. Standard bullion coins include the 1/20oz, 1/10oz, ¼oz, ½oz, and 1oz coin. Large bullion coins include a 2oz, 10oz, 1kg, and 10kg coin. Any Lunar Gold coin consists of 99.9% gold. Limited production is one reason for the popularity of this series. While the 1-kilo, 10-ounce, and 2-ounce gold coins are unlimited; only 30,000 one-ounce coins are struck in any year. Similarly, one-half ounce coins are limited to 40,000, one-fourth to 60,000, one-tenth to 80,000, and one-twentieth to 100,000. Once the cap has been reached, no more of these coins may be struck and they are henceforth only available on secondary markets. Yet, if the cap has not been reached, the Perth Mint may indeed strike backdated coins. In 2011, the Perth Mint produced a 1-ton coin to emphasize its international reputation for innovation, ingenuity, and technical excellence. Australian Lunar gold coins are issued in more sizes than any other gold bullion coin in the world. All coin in the Lunar Gold series are made of pure gold, rendering them a desirable investment vehicle for investors and collectors alike due to their precious metal content and (largely) limited availability.